The Aylsham Road is the long, straight, slightly climbing route out of the centre of Norwich towards the north coast. Busy at any time of the day, I always find it a pleasure to cycle into the city along its broad length, overtaking the cars, although it is rather rather less enjoyable to cycle out again this way. 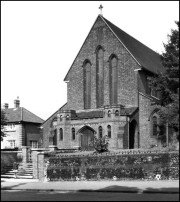 About half a mile beyond the inner ring road, in what is technically New Catton, once stood the imposing red brick church of St Luke, built to the designs of the Blomfields in the years immediately before the First World War. It had the castellated galilee porch familiar from AJ Lacey's churches for the city of the previous decade; the west window above was a rather less successful triple lancet. George Plunkett photographed it one day in 1962. 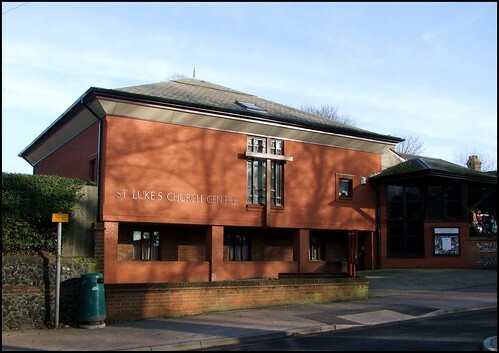 St Luke was demolished in 1989, and replaced with this pleasing new building which is at once typical of the following decade, and an adornment to what is a relatively architecturally insignificant area of Norwich. The long, red brick structure shelters a covered area at ground level into which the congregating plaza feeds, as though this was perhaps a lecture hall of a campus university. The low hipped roof with its wide eaves gives the building an elegance which is almost oriental in character. At the southern end of the frontage is a curious pagoda-like structure, presumably a reception area for the door below. The dedication stone was laid by the Bishop of Norwich to the Glory of God and the Extension of his Kingdom. Judging from the notice board, this building is used a great deal for a wide variety of church and secular activities, and must be a real asset to its local area. And, after twenty years, it still looks thoroughly contemporary.